SRS - Compass Issue 11 - Why American Chestnut? Compass is a quarterly publication of the USDA Forest Service's Southern Research Station (SRS). As part of the Nation's largest forestry research organization -- USDA Forest Service Research and Development -- SRS serves 13 Southern States and beyond. The Station's 130 scienists work in more than 20 units located across the region at Federal laboratories, universites, and experimental forests. Why go to so much trouble to restore American chestnut when other blight-resistant chestnut species from Asia will grow in the former range of the American giant? Uniquely adapted to Eastern North America, the American chestnut tree lived longer and grew taller than the Asian species. Flowering late, the tree was unaffected by the late frosts that are typical of the Appalachian Mountains. 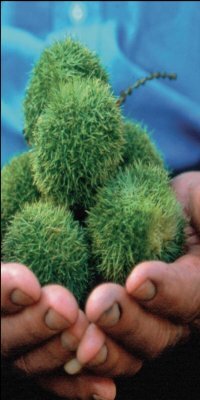 American chestnut trees produce more hard mast than other chestnut species; their nuts have been shown to have higher nutritional value and were once the major food source for wildlife and for livestock in rural communities. Before the chestnut blight, American chestnut lumber was a major rural industry; lightweight, straight-grained, and easily worked, the wood was ideal for fence posts, railroad ties, barn beams, and home construction—as well as for fine furniture and musical instruments.